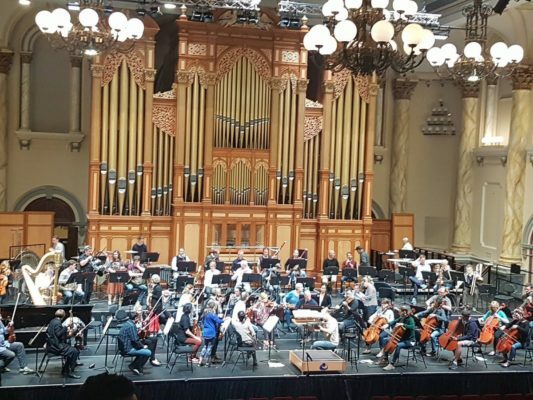 On Wednesday 20 September, the Year 8 and 9 Music Focus students attended an open rehearsal of the Adelaide Symphony Orchestra. 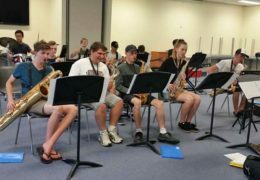 The day showed us how each individual band member contributes to the orchestra and creates a larger sound. When we first arrived at the Adelaide Town Hall, we met the Concertmaster and the Conductor. They told us several interesting facts about the orchestra and their positions within it. We were then given a chance to ask some questions. Once we were seated in the Grand Hall, we watched the orchestra setup, tune and start rehearsal. 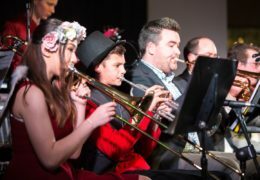 By watching the orchestra, we were exposed to the environment and level of professionalism commonly found within professional orchestras. A highlight of the day was listening to the pianist, Konstantin Shamray, play Tchaikovsky’s Piano Concerto No 1: 2nd Movement along with the orchestra. This was a truly unique and memorable experience that showed us one of the many opportunities that are available in music.